I’m writing to you because I was the text editor on the story on exotic pets in this month’s issue. Christy, who was the researcher/fact checker on the article, forwarded me your email and I wanted to get back to you right away to say I’m so sorry you are unhappy with the caption that accompanied your photograph. The wording on the caption went through many versions in an effort both to be accurate and make it fit the tight space, and what appears to have happened, after the initial revision, is that one of our top editors wanted us to locate each photograph geographically by state. When the writer went back in to add your location in Texas, she inadvertently made the mistake of using the verb “bought” instead of “adopted,” and we did not catch the distinction. We would be happy to print a correction to reflect that. I want to say that, despite the error, I do think the overall impression any reader would have on seeing your wonderful portrait with Garibaldi Rous would be very positive and affirming of the real affection and connection that come through in the photograph. I think reading your strong and passionate quote in large display type is much more likely to be what readers take away from the spread in the magazine. Again, please accept our apologies for the error. Garibaldi with Dr. Sharman Hoppes and a bunch of veterinary students from A&M. Thank you for your reply to my email. I would appreciate a correction but only if you correct the entire problem. There are two major issues with the extremely short caption which entirely change its meaning. The first is that I adopted Garibaldi rather than purchased him. The second is that I have said that capybaras “tend to die young in captivity,” not that they “die in captivity.” You also eliminated the information about how Gari came to me with known medical issues. The caption as it is pretty much makes me into a capybara serial murderer. I cannot tell you how much I resent that, not just for myself but for all capybara owners and for the owners of other exotic animals. Domestication is a process. It starts with a wild animal and, after some number of generations, you end up with a domesticated animal. Some species are more likely to be successfully domesticated than others. 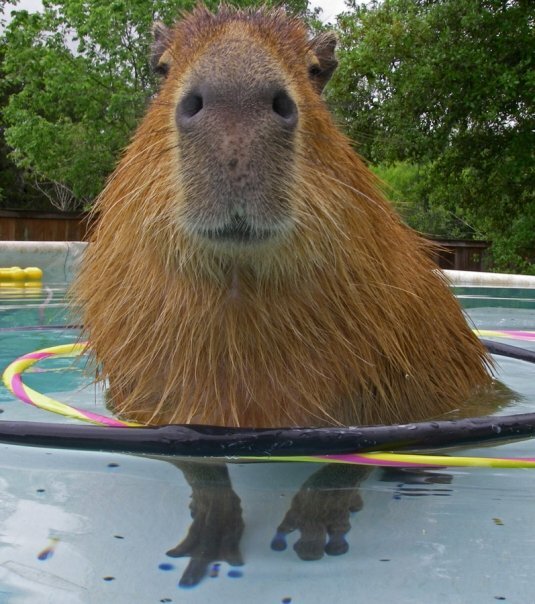 I believe that capybaras have an excellent chance at being successfully domesticated. Their near cousins, guinea pigs, have been domesticated for thousands of years while another close relative, the chinchilla, has been domesticated more recently. The fact that capybaras are gregarious animals with a basically herd-like social structure in the wild also indicates that they would do well as domestic animals. 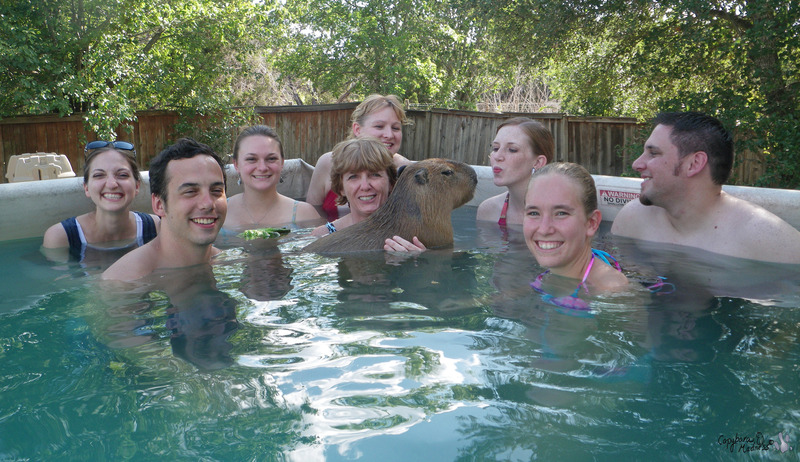 Wild capybaras sometimes live in close proximity to people and interact with them amicably and voluntarily. The problem is that we do not yet know what it takes to keep these animals healthy in a captive environment. 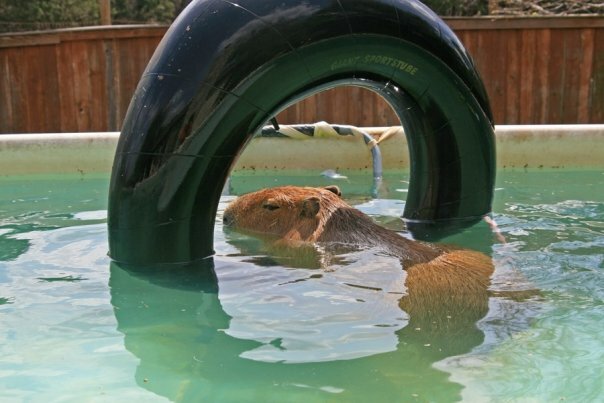 My charity, The ROUS Foundation for Capybara Veterinary Medicine, was formed in conjunction with the Texas A&M College of Veterinary Medicine to try to understand why it is that captive capybaras tend to die young. So far we have uncovered a couple of major care issues. The first is that capybaras, like other members of the cavy family but unlike almost all mammals other than primates, require vitamin C in their diet. A deficiency inf vitamin C results in scurvy, which can range from mild failure to thrive to death. 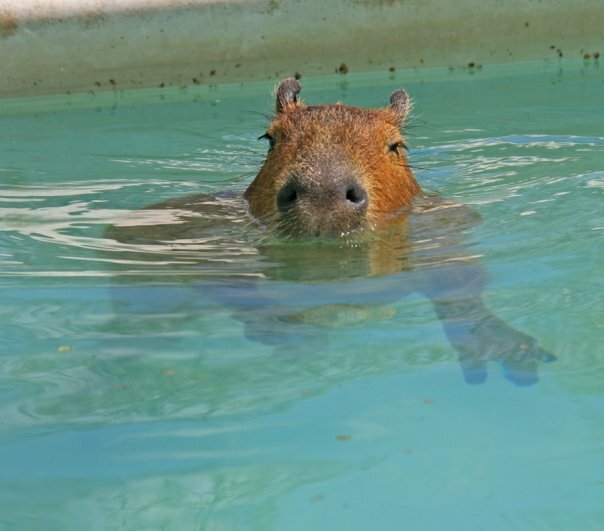 The second is that capybaras are very sensitive to toxins, including many plants commonly found in homes and yards. But maybe I’m getting off topic. 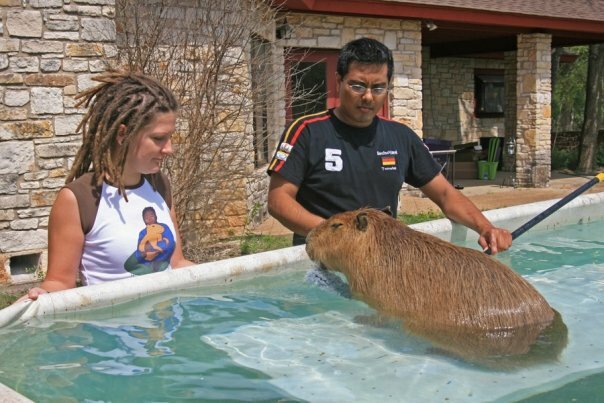 The fact is that we are making progress on domesticating capybaras. And when I say they tend to die young in captivity, I don’t mean that their captive life expectancy is less than that of a wild capybara. Wild capybaras typically die very young, very violent deaths. But we expect more than that from our pets. 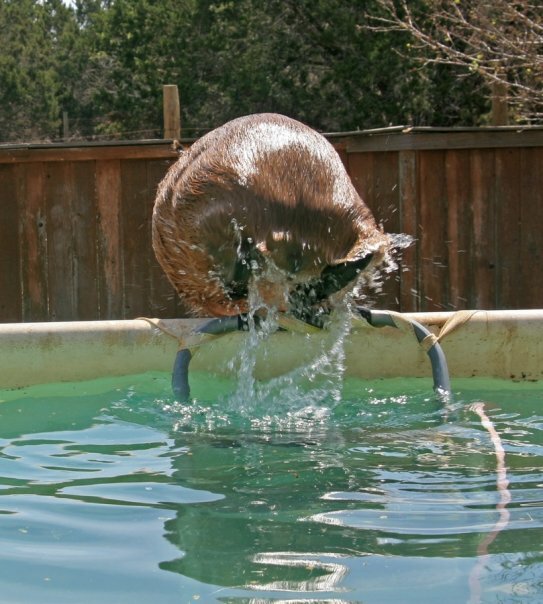 I do know of a few privately owned capybaras that have lived well into their teens, one even to the age of 18 years, something that has probably never happened in the wild. The thing I am most disappointed about with your article is that you could have done so much more. The article was long enough to actually explore the issue of exotic pet ownership but you chose not to do that. Instead you went straight to the fear mongering sensationalism that is so prevalent in today’s media. You put a hedgehog, a newly domesticated animal which is wrongly still considered exotic, on the cover and yet the text of the article does not even hint that many common pets have been in domestication for two hundred years or less. Other examples of recently domesticated pets are hamsters, parakeets, gerbils, and chameleons. Until recently, humans did not have the time or resources for the luxury of a pet or companion animal, which is probably why so we have so few species of truely domesticated pets. Not all exotic pets are big, dangerous, or threatened in the wild. The goal of domestication is not to reintroduce animals into the wild. Neither is it to preserve the genetic diversity of a wild population. The goal of domestication is to produce a domestic animal that can enjoy a long, happy life in the company of human beings and which can thereby improve and enhance our own lives. Why is it that your article did not touch on this aspect of exotic pet ownership? If you’re having trouble finding someone to write this side of the argument for you, I would be happy to help out. I doubt it will do any good but at least I have tried. Wow! As a reporter I made mistakes, and I can totally understand the caption mess up, but totally missing the point to the article, or misrepresenting the point, is inexcusable. I doubt your email will make a difference. Magazines are struggling and trying for new markets. More people want FoxNews than NOVA. I’m really sorry they total missed the point. It never hurts to try though – I also wrote to National Geographic about this. I hope many others will too! For shame! I’m not sure what emotion is winning at this point: “outrage” over their clear misrepresentation of your story or “disappointment” in a magazine that I grew up loving and cherishing for 40 years. This makes me question everything that is reported by NG, something I always took at face value. I have publicly shared this link on my FB page (most of my shares are Friends only). As an editor, I understand the difficulty of space, but I also understand that the original voice MUST be kept to sustain the integrity of an editor. Guess they don’t care about integrity. Very nice and your stroke did not impair your thought process or intellect at all. Well said, Mellie. They should, at the very least, publish your letter verbatim. But I doubt that they will since it would make them look bad. Their excuses for misrepresenting you seem ridiculous. One of the cheesiest excuses I’ve ever heard! The under estimated you Melanie. I say “go for it.” Insist they print your reply verbatim. I too think they should publish your letter and an apology. I think that would actually benefit them, to show their consumers that they make mistakes too and can admit too it. I think that would actually help their sales. NG has a good reputation and you would think they would want it to stay that way. A very well-written response. I really appreciate that you are being very rational & logoical about the entire concept of “domestication”. I was in Texas when the “Dangerous Wild Animals” legislation was enacted. It is a very different term than “exotic”. I regularly asked animal control officers how their community was handling the new law and received in reply, “We have banned all exotic animals from our city”. So you just made my guinea pig (an exotic, ie – “non-native”) illegal, but I can keep a cougar or 8′ rattlesnake (both of which are native to the area)? Really made them re-think the terminology they use. Maybe the correct nomenclature is “non-traditional pets” which would cover house-kept pigs, chickens, skunks, etc.? Well said! When you compare the environmental footprint of having a pet dog or cat versus a pet capybara, the capybara will win every time, especially for people who live in swampy, grassy areas. 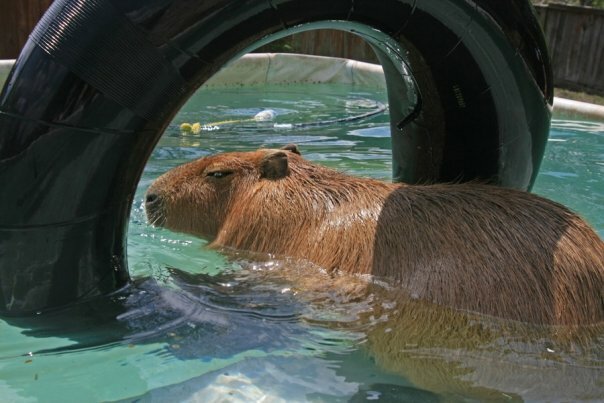 Dogs and cats require protein-rich diets, while capybaras obtain the majority of their protein from microbes in their gut. 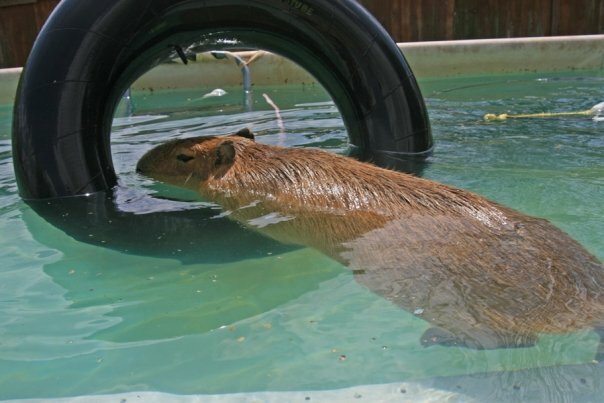 Manure from capybaras can enrich the soil, rather killing plants like cat or dog manure. 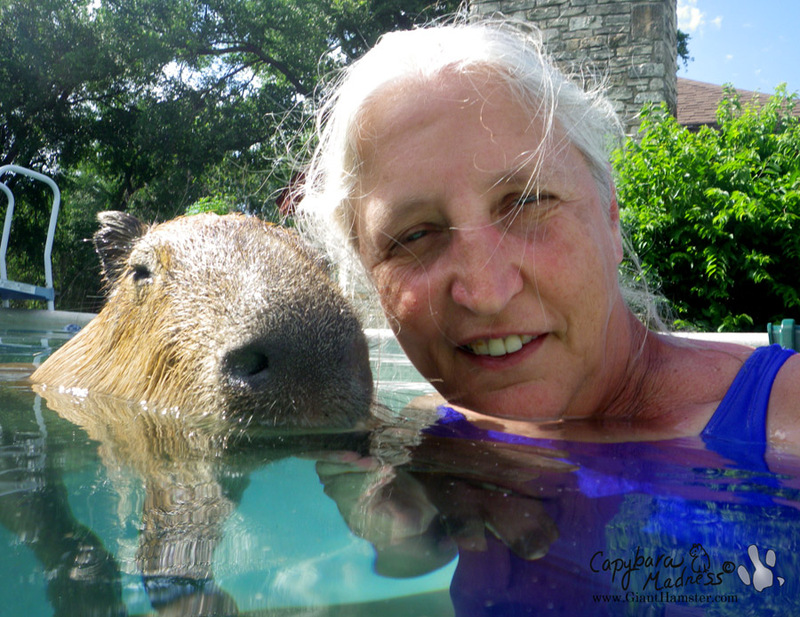 We need to domesticate more environmentally friendly pets, and the capybara is a good choice. You took Gari from an unhealthy situation (mercifully his previous owners recognized that) and made him very happy. He had everything he could possibly have wanted. 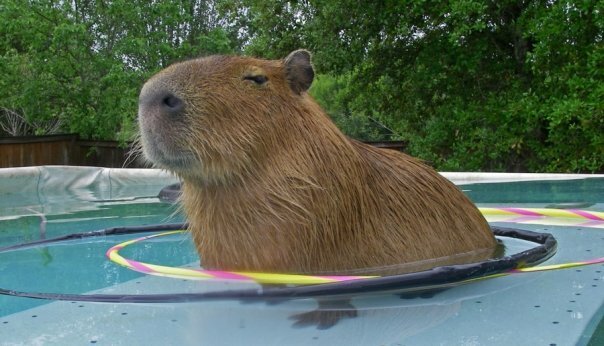 He was a happy capy. Thanks for the update. I’m at a loss for words over National Geographic’s treatment of this whole exotic pet issue. It used to be one of my favorite magazines, but now I’m not so sure. your response was excellent! I hope the magazine takes you seriously. I am so sorry to see what they will stoop to in order to sell issues. I first read about Garibaldi in the National Geographic feature. Just saw him on the Preposterous Pets TV show, and did some googling to see how he was doing. I’m so sorry to hear of his passing earlier this year, but am glad to see he was well cared for during his short time on this earth. When I read that National Geographic feature, something about that article just didn’t sit right with me. Even though my views on exotic pet ownership are closer to the author’s, it bothered me how the author was practically pathologising exotic pet owners as selfish people who feel the need to control and dominate untamed animals. There seemed a complete lack of nuance on a very complex issue, and I felt it was a bit of a disservice to all those people who’d been tirelessly looking after these animals and let the Nat Geo team into their lives for this feature. Still, I had no idea the extent to which you were misrepresented until I visited your site. There is a WORLD of difference between say, buying, a dog that was most likely bred in a horrendously unethical puppy mill, and adopting a dog with health issues from a shelter. That the Nat Geo team just glossed over the ‘bought/adopted’ error perhaps says something about their journalism ethics.